Quite often, I find myself stuck behind someone going 25 in a 45 zone, and understandably start yelling at the unknown person whose sole purpose is obviously to ruin my day. But many ultra-careful (read: slow) drivers are simply old folks who could easily be our parents or grandparents, and have no choice but to drive given the lack of reliable public transit in the majority of America. I often wonder why these people are still allowed to drive, and one incident that recently made the news makes me question it even more. The incident I’m talking about involves a 92-year-old man, Russell Kerr, who was at his neighborhood Piggly Wiggly picking up groceries in Mayville, Wisconsin. 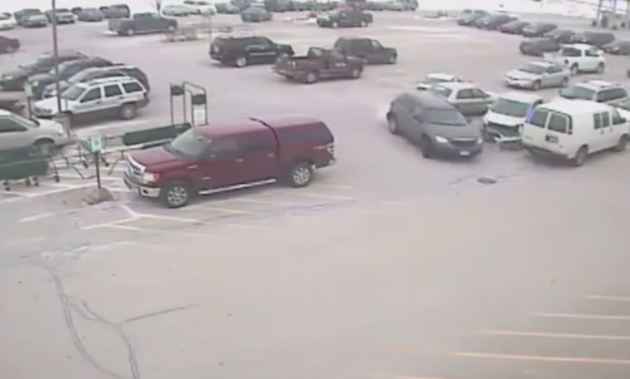 As he was navigating the parking lot, he got his foot stuck on the accelerator, panicked, and managed to hit a total of nine cars in less than a minute. Two of the cars involved were occupied, but luckily no one was hurt. Police are considering this an accident, and are therefore not pressing charges against Kerr. However, the report was forwarded to the DMV, which will ultimately determine whether or not Kerr needs to be retested in order to continue driving. According to WISN, the Wisconsin DMV requires a vision standard of 20/100 or better in at least one eye, which means that the subject can see at 20 feet what someone with perfect (or 20/20) vision can see at 100 feet. Additionally, the subject must have at least a 20-degree horizontal field of vision. While this video goes viral, it’s important to consider that elderly people like Kerr often have no choice but to drive—but that doesn’t mean that they should be driving. Perhaps it’s time to come up with a better solution for those who could pose a danger to others on the road.